Oliver Mtukudzi’s family were out in force at the moving memorial service in Johannesburg on Tuesday. 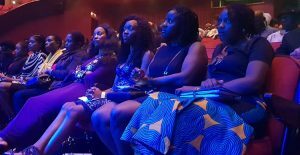 Fans of music veteran Oliver Mtukudzi made their way to the Joburg theatre on Tuesday afternoon to pay tribute to the legend at a special memorial service. The musician died in a Harare hospital last month after a long battle with diabetes. He was laid to rest in his home country of Zimbabwe on January 28 after a massive funeral service. The memorial was directed by celebrated SA jazz muso Steve Dyer who told TshisaLIVE that he wanted to celebrate his friend’s life with a special concert memorial. The memorial was filled with touching tributes and emotional music from those close to the star including Vusi Mahlasela, Ringo Madlingozi and Berita. Here were just five moments that had us reaching for the tissues. The memorial started with a tribute from the star’s family. A representative took to the stage to thank fans for their support over the past few weeks. In a moment of pure emotion he spoke of the hardships the family faced in the weeks following Mtukudzi’s death. He went on to tell South Africans to hold on to Mtukudzi’s memory. Two of the star’s band members, Fiona and Charles, also took to the stage to pay tribute. Fiona spoke of the lessons they had learnt from their “father” and how he drew them close to him in his final days. She said that the band was still trying to come to terms with his death. South African music legend Vusi Mahlasela paid tribute in song, singing an anthem about the lessons African music can bring to the world. Walking on to stage with wooden cane in hand, Mahlasela looked fragile. But once he started singing, energy filled the room and replaced the silence with strings of beautiful sounds. In a brief speech he spoke of Mtukudzi’s work in evangelising African music as part of a group of pioneers from southern Africa who helped change the world’s view of Africa. “The man is gone but his spirit will carry on. God bless you, Ntate. Musicians never die,” he added, to cheers from mourners and Mtukudzi’s family. Bassline founder Brad Holmes revealed in his speech that Mtukudzi was booked to perform at the iconic Joburg venue later this year as part of a show to honour legends of the industry. Tears flowed as he spoke of how the star would never again fill the venue and bring smiles to thousands of fans. Music producer and Mtukudzi’s close friend Peter Tladi used part of his tribute to issue a call to the Zimbabwean government. Addressing Zimbabwean president Emmerson Mnangagwa, Tladi said it was time for exiled artists to be welcomed back into the country to reignite the arts and culture sector and improve the economy.